The Gray Iron Fitness Newsletter, Issue #228 What is healthspan? In 2015, Scientific American* published an article suggesting that living longer doesn’t necessarily mean living better. It’s a lesson learned from the tiny roundworm called C. elegans, a common workhorse in basic biology lab work. Researchers gathered two groups of roundworms. One group was put on a calorie-restricted diet, the other not. What they found was they could extend the lifespan of the worms on a very low calorie diet. But the healthspan—that is the period of worm fitness and health—was the same in both groups. In other words, the extended lifespan did not come with extended fitness and health. The longer-living worms spent the extended period of their lives in a diminished state—with less mobility and stress resistance. Of course aging worms are not aging people. But if the findings do extend to people, as some scientists suspect, then life-extension efforts may not result in a better old age, just more years of frailty. How much life extension would any of us want if the added years were to be spent in a nursing home? Jack LaLanne use to say he didn’t care so much how long he lived (though he died at 96). What he most cared about was his quality of life while he lived. The purpose of following a fitness lifestyle evolves as we age. As young people our thrust may have been to develop great strength, or tremendous endurance, or even body perfection. To some extent, such desires may remain as seniors; but to a much lesser degree, I would think. More important, our primary objective as we age should be to extend our healthspan. That is, to stay as fit and healthy as possible for as long as possible. And here is where resistance exercise comes in: free weights, machines, and/or resistance bands are the antidote to decrepitude. 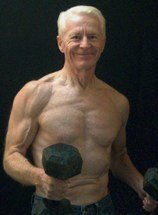 A primary culprit in old age is the withering of muscle that robs the elderly of strength and, eventually, their independence. While resistance exercise, along with some cardiovascular work and flexibility movements, preserves the quality of youth like nothing else. Discover more about the miracle of resistance exercise here. * Founded in 1845, Scientific American is the oldest continuously published magazine in the United States. It is a leading source for science, technology information and policy for a general audience. Do you take any food supplements? Any vitamins, herbals, protein powders or diet pills? Most of us take at least one or two. Some take several. The supplement business is big business. It’s estimated that in America we spend about $30 billion a year on things like Echinacea, gingko biloba, St, Johns Wart, whey proteins, vitamins, and Lord knows what others. We aren’t alone. Other modern nations are similarly attracted. Are we getting our money’s worth? Not everyone thinks so. Here’s one source: According to the SCAN Health Plan, an HMO with a Medicare contract, several studies showed results that are troubling, to say the least. Consider . . .
A majority of supplements studied didn’t have any of the ingredients they claimed to have. Did you hear that? A majority of them didn't have any of the claimed ingredients, according to SCAN. Instead, they were made of powdered rice, soy, or wheat. Some vitamins and supplements had the ingredients stated, but in smaller amounts. Vitamins that claimed to provide your recommended dose of vitamins and minerals had less than half of that. One herbal supplement contained a weed that causes rashes and nausea. Some other supplements contained plants that weren’t on the ingredients list. I don’t personally know who tested the supplements. Not all studies we read about are valid and unbiased. However, I can say that I have found the SCAN Health Plan people highly reputable. Disseminating findings that haven't been checked out would be out of character. I subscribe to ConsumerLab, an independent laboratory that tests a wide variety of supplements. Some products, though not a majority, fail their testing for not having the claimed ingredients; and some fail because they contain foreign—and sometimes dangerous—substances. ConsumerLab provides the names of those that pass or fail and why. Since there is little oversight of the supplement business, I don’t know how you and I can truly know what we’re buying, without an independent laboratory that tests the products and reports their findings. And I stress the word independent when talking about laboratory testing. My further thoughts about supplements are here.